Here is a selection of properties for sale Spain. Large 3 bedroom, 3 bathroom penthouse with stunning coastal views. Located in an elevated position between San Pedro and Estepona. This large 3 bedroom, 3 bathroom duplex penthouse with solarium is located in an elevated position midway between San Pedro and Estepona. The property offers excellent views across the gardens, the mountains and out across the Mediterranean. The property is situated on the 5th floor and accessed via a lift from the garage. The accommodation comprises an entrance hallway with with built in wardrobes, spacious full width lounge/dining room with access to a southwest facing terrace with sun blinds from which there is a commanding sea view. Kitchen with built in appliances including oven, hob, fridge freezer and dishwasher. Store room off. Guest bedroom Nº 3 with fitted wardrobes and bathroom with bath and shower over. Integrated washer/drier. On the upper level there are two further bedrooms the master bedroom has a dressing area with an extensive range of fitted wardrobes and access to a private terrace. Bathroom en suite with bath with shower over. 2nd bedroom with fitted wardrobes, private terrace and bathroom en suite. On the top floor there is a solarium with sitting and sun bathing area. Well maintained gated community with luscious tropical gardens and large swimming pool with sun bathing area. Marble floors, hot and cold air conditioning, garage parking space. Another sold Bargain Properties at property sale Spain. Stunning 3 bedroom, 3 bathroom duplex penthouse with panoramic views of Mijas mountain and the coastline, set in the exclusive La Mairena area. Beautifully presented duplex penthouse with panoramic views of Mijas mountain and the coastline in a luxury Golf complex set in the exclusive La Mairena area. 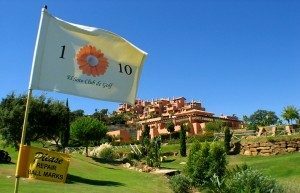 Situated in the hills above Elviria in an area of outstanding natural beauty protected by UNESCO. The community includes extensive tropical gardens with several swimming pools and there is a also a private 9 hole golf course which is free to play. This delightful 3 bedroom apartment provides family sized accommodation which is ideal as a family home or a luxury holiday getaway. The property has two garage parking spaces in addition to a store room. Hot and cold air conditioning. Cream marble floors and marble bathrooms. Electric persianas and “intelligent” house system. The community includes extensive tropical gardens with several swimming pools and there is a laso, a private 9 hole golf course which is free to play. The club house incorporates a restaurant, bar and there are also gymnasium, sauna and Turkish bath facilities in addition to tennis courts and putting green. The accommodation which is well planned and beautifully presented includes an entrance hallway, large lounge/dining room with open fireplace and sliding doors opening onto an extensive terrace. The kitchen is fitted with a comprehensive range of units including granite worktops, oven, ceramic hob, cooker hood, microwave, dishwasher and fridge freezer. Utility room with washing machine. On the lower level there are two bedrooms with fitted wardrobes and en suite bathrooms. The master bedroom which has a vaulted ceiling and open fireplace is situated on the upper level. There is access to two additional terraces which have fabulous views. There is a dressing are with fitted wardrobes and a large luxury en suite bathroom with bath and large walk in shower. The property has two garage parking spaces in addition to a store room. Hot and cold air conditioning. Cream marble floors and marble bathrooms. Electric persianas and “intelligent” house system. Another sold Bargain Properties at property sale Spain. 190 m2 plus 60 m2 terraces. Garden apartment within walking distance to amenities and Puerto Banus. 1 bedroom (originally 2 bedroom) 2 bathroom. This is a very spacious 1 bedroom (originally 2 bedroom) , 2 bathroom garden apartment situated in a modern Development within walking distance of Puerto Banus and all amenities including the shopping, restaurants and the Casino in Nueva Andalucia. The property is beautifully presented to an individual style and has the huge advantage of having its own private west facing garden from which its possible to create an entrance that gives you direct access to the community garden and beautiful swimming pool. The accommodation briefly includes an entrance hallway with fitted wardrobe, spacious lounge with direct access to the rear terrace and garden, comfortable seating / television area (originally 2nd bedroom), kitchen with fitted units and appliances including dishwasher, oven, hob, cooker hood and fridge freezer. There is also a utility area with washing machine and dryer, again with direct access to the garden. The master bedroom has fitted wardrobes and their is a bathroom en suite to the Master. There is a second bathroom which is currently being used as a guest cloack room. The private garden/terrace area consists of 2 independent terraces. The property has marble floors, hot and cold air conditioning and there is s a garage parking space and storage room. Originally a 2 bedroom apartment but can easily be reconverted! Another sold Bargain Properties at property sale Spain. Very spacious ground floor 2 bedroom, 2 bathroom apartment with small private garden. Open views, very good qualities. Gated community with two pools. This is a lovely apartment situated in a quiet location yet only a few minutes drive into Elviria centre, the beach and all other amenities. Brand new and never been lived in. Entrance hallway, very large lounge with access to a covered terrace which in turn leads to a small south facing garden area. Open plan American style kitchen with granite worktops and appliances including oven, ceramic hob, dishwasher and fridge freezer. Utility area with washing machine. Two bedrooms, both with fitted wardrobes and two bathrooms. Underground parking, store room, cream marble floors, hot and cold air conditioning. Electric blinds. Another sold Bargain Properties at property sale Spain. Large 2 bedroom ground floor apartment, just reduced in price. Very bright garden apartment situated in a prestigious urbanization in Elviria Hills. Comprising 2 bedrooms and 2 bathrooms, of which the master is en-suite, both fitted with cupboards and wardrobes – bathrooms equipped with underfloor heating. Part of the terrace have been incorporated in the living areas, accommodating now a proper dining area and additionally allowing lots of daylights in. Garage and storeroom. Lovely lounge with dining area, fully equipped kitchen with utility fitted with washing machine, tumble dryer, cupboards and security grills. Among the fixtures and features are top quality cream ivory marble floors throughout, air conditioning hot and cold, alarm system, double glazing and marble bathrooms. Sunny partly covered terrace with storage facilities and a proper storeroom and parking space for one car included in the price. The apartment comes partly furnished. Another sold Bargain Properties at property sale Spain. Excellent condition with lots of extras. Realistically priced for quick sale: Walking distance to Puerto Banus. 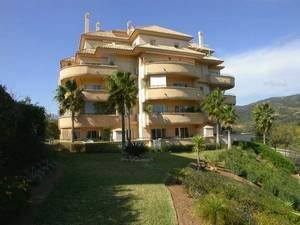 Very spacious 2 bedroom, 2 bathroom ground floor apartment in the prestigious La Alzambra Development. This large ground floor apartment is the perfect permanent or holiday home situated in a prestigious location with lush communal gardens and impressive swimming pool area. A tranquil location and yet only a few minutes walk to all the shops, marina and the other facilities offered by this cosmopolitan resort. The accommodation includes and entrance hallways, large lounge with dining area and doors onto an extensive south and south west facing terrace from which there are partial sea views. The kitchen is fitted with an extensive range of units, granite work tops and Siemens appliances including oven, fridge freezer and dishwasher. there is a Utility room with Siemens washer and dryer. The master bedroom has a dressing area with fitted wardrobes and bathroom en suite with under floor heating. The second bedroom has fitted wardrobes and further en suite bathroom with under floor heating. There is garage parking space and store room. Lift access. La Alazambra is a secure gated community with 24 hour security. Hot and cold air conditioning. Cream marble floors. Another sold Bargain Properties at property sale Spain.